Theresa May is heading to Brussels for an EU summit, the morning after surviving a vote of confidence. 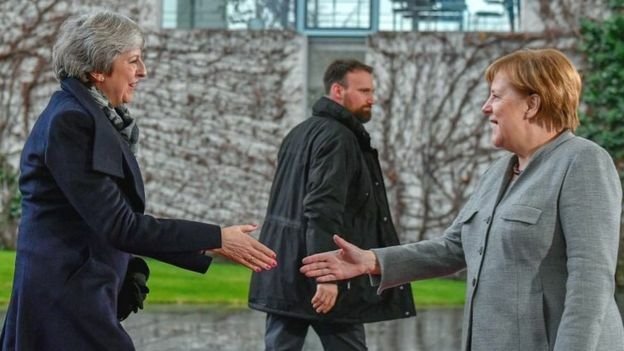 The prime minister is seeking legally binding pledges from EU leaders on the “backstop” – the plan to avoid a return to a manned Northern Ireland border. Critics say the plan will keep the UK tied to EU rules indefinitely and curb its ability to strike trade deals. The EU says it will not renegotiate the backstop but may agree to greater assurances on its temporary nature. It seems unlikely that would win over enough support for her Brexit plan to have a realistic chance of getting through the House of Commons, with tensions heightened in the Conservative Party in the wake of Wednesday evening’s vote. Theresa May did win the ballot of Conservative MPs, on whether she should remain their party leader, by 200 votes to 117. But in a last-minute pre-vote move, she offered a promise to her MPs that she would step down before the next election. BBC political editor Laura Kuenssberg said that sort of move tends to lead to power “draining away”, adding that the party’s “rival tribes might be now set on a course to pull her – and themselves – apart” with the expectation that at “some point she will have to change tack on Brexit”. Speaking in Downing Street after the vote, Mrs May vowed to deliver the Brexit “people voted for” but said she had heard the concerns of MPs who voted against her. But Liberal Democrat leader Sir Vince Cable said, despite the “high drama” of Wednesday, “nothing has really changed”. But a trip to meet the Irish Taoiseach Leo Varadkar had to be cancelled because of the leadership vote. At Thursday’s summit, Mrs May will have an opportunity to spell out face-to-face the problems to leaders of all the other 27 member states. The EU leaders will then consider what could be done – without Mrs May in the room. Theresa May will front up in Brussels later – still the prime minister, still officially in charge. One cabinet minister last night told me the whole challenge to her had been “futile”, suggesting it hadn’t really changed much. But it really has. Theresa May has a temporary shield from another direct call for her departure from her own MPs . Angry Brexiteers can’t try to move her out for another year in the same way. That on its own is a sigh of relief certainly for her supporters, claiming a “good result” last night. Labour has said that it will table a no-confidence motion in Theresa May’s government that all MPs – not just Conservatives – will be able to vote in – but only when they felt they had a chance of winning it, and forcing a general election. Shadow Chancellor John McDonnell urged Theresa May to work with Labour on getting a deal with the EU that “will protect jobs and the economy”. He said there was an “overwhelming majority” in the Commons against a no-deal Brexit but the prime minister should now hold a series of votes to establish what other options MPs were willing to accept.